Feast or Famine Winter Training: A blessing in disguise? Chicago’s freezing weather has forced me to hibernate for days at a time. Last week’s brutal -50°F windchills knocked out a couple days, and this week a combination of sub-10°F temperatures with stiff 20-30 mph winds have compelled me to flex in a couple of days off. This has led me into a feast/famine schedule, where I’ll run 4-5 days in a row, then run very little for a few days, then repeat. If Chicago’s weather can stabilize into something consistently tolerable, I’ll resume a more normal training schedule. But I realized this schedule is very similar to one that emergency workers (hospital medical staff, firefighters, law enforcement) follow, along with to some extent expo workers. They work long hours for several days in a row, then they get several days off in a row. In the case of emergency staff, working a regular 8 hour shift is often impractical when attending to real-time emergencies. In the case of expo staff, they work when convention services are needed, and those periods often come in peak-season blocks rather than everyday on a 40 hour schedule. Obviously, there are drawbacks to life with such a schedule. No one ever argued this was an optimal schedule. However, not only do workers put in entire careers on such a schedule, but (taking a bit of a logical leap here) it’s entirely possible that runners could to some extent do fine on the same schedule. In fact, runners kind of do. We train hard for goal races in 8-24 week cycles… then we take longer breaks before resuming training for the next goal. Even the famous elite Kenyan runners take weeks or months off following their marathons. We couldn’t train as hard as we do unless we took breaks at some point. Sometimes, injuries or life force those breaks. But many end up taking them by choice or other willing circumstance. It’s during these breaks that the body and mind rebuild, allowing us to train hard the next time around. You don’t grow stronger during training, but during the recovery between bouts of training. So back to this strange-to-many feast or famine schedule: Imagine 4-5 days straight of moderate running, with a long run at some point, perhaps a speedwork session early on… then 3-4 days of no training, or perhaps a short run or two during that period… before another 4-5 days straight of moderate/long running. That moderate period might really beat you up, but then you get that long subsequent period to heal up from all that work. You’re possibly almost chomping at the bit to get back at it two days before you resume training. By the time you get back to longer runs, you’re physically and psychologically fresh. The latter situation is actually the idea behind a marathon taper. You spend months grinding yourself to get ready for the race. Then you scale back your training to too-little-running, so that your body and mind can heal up and running can become fresh again once it’s time to run the actual race. I won’t go as far as to say everyone should do this. If I had it my way, I’d have trained normally over this past month, instead of having to stall training for 2-3 days due to severe weather. But in a way the severe weather was an opportunity to rest up and recover. So long as I maximize the time to train while the weather is good, the time off could maximize the recovery and growth from that training. In the sunset darkness of the Wilson Track, with snow pellets coming down, there was one set of footprints coating the growing frost in Lane 3. That was me. I ran 3 x 2 mile repeats last night at the Wilson Track. The 3x2mi is a 10K workout from Greg McMillan that while demanding will clearly show the pace you’re capable of running in a 10K. I’m not only training for the Tour De Trails 6 Miler but also the Mardi Gras Chaser 10K in early March… along, of course, with the Vancouver Marathon. Thanks to snow flurries and general cold overcast throughout the last 24 hours, the track had some dubious patches of water and generally required some caution for use. I stuck to lane 3 as that was the inside-most lane enough to use in its entirety; even then, I had to ride the outside edge in some spots along the home stretch to avoid overlapping inside puddles. However, snow pellets came down as I began my 2nd rep. Never mind hitting me in the face on the front stretch… pellets began coating the track surface, limiting traction and slowing me down while demanding more of my lower body to maintain form and movement. Nothing keeps your stride compact quite like trying to run tempo reps on a frosty track. Most would have stopped a speed workout in this situation, unable to meet pace expectations and fearing falls and injury in the conditions… especially in footwear like mine: I was wearing my Topo Athletic ST2‘s, flats primarily intended for racing and speed running. I had the added bonus in wearing the least suitable running footwear for icy conditions! However, along with knowing how to run in snow and ice, I also realize a tempo workout can still serve my desired purpose in less than ideal conditions. They’re about more than hitting a goal time. 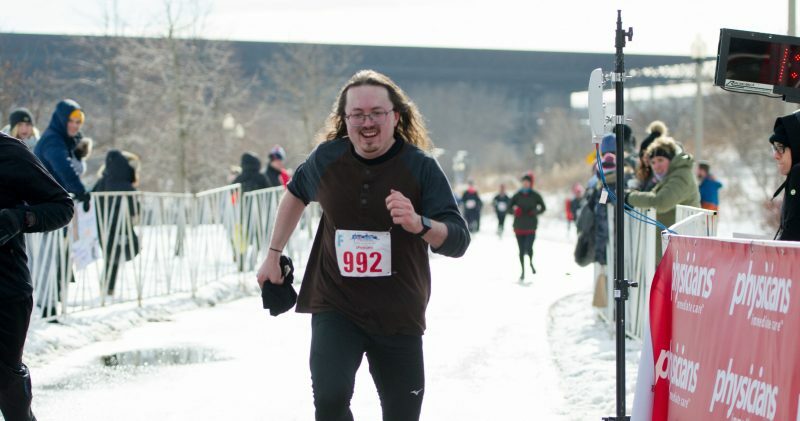 Instead of disappointment in reps at a pace below my PR time, I see I can capably run a 10K at a pace 20 seconds slower than my PR in icy, increasingly slippery conditions. Plus, with three trail races still to come, I also need to prep for running fast on uneven, probably slippery conditions… as I had to in the Tour De Trails 3 Miler a couple weeks before. Maintaining the best pace I could on a frosty track that didn’t provide great traction helps develop lower body muscles that will need to do serious work in next month’s 6 Miler plus the longer trail races beyond. Now, not everyone should do this, and I wouldn’t keep a speed workout going every time ice started coating the surface. There are a lot of winter days where I’d bag a planned speed workout and do something else. But this was one day where, as the conditions grew farther from ideal, the workout still provided growth opportunity and still served its purpose. Quality workouts intend to prepare you to race, not just hit a goal time.